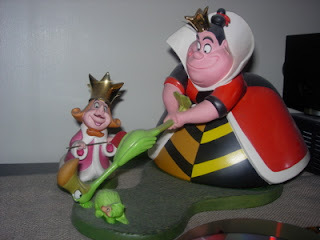 My Magical Collection: The Queen of Hearts from Walt Disney's "Alice in Wonderland"
The Queen of Hearts from Walt Disney's "Alice in Wonderland"
This is a Walt Disney Classic Collections sculpture of the Queen of Hearts from Walt Disney's "Alice in Wonderland", along with the King of Hearts. The Queen is playing croquet. The name of the sculpture of the Queen is "Let The Game Begin!". Both of these sculptures were retired by WDCC a few years ago. You can still find these sculptures on Ebay sometimes, but they are rare. WDCC Panchito from "The Three Caballeros"